Every morning, it is my habitual manner to see my face in front of the mirror before breakfast, and notice my age and feeling of the day. Especially, when I notice my sagging face, I remember when I was young, healthy, and very aggressive. And then there, I came to realize that sagging face could tell our health condition of the day. Truly, just like a fortune teller, the face will tell everything you want to know according to plastic surgeons. You can think that sagging face is the remembrance of your assets. This may be true, but from studies done by our group, wrinkles can tell your health condition. Let's take the case of headache, stiff shoulders, insomnia, and depression. Definitely, it will emanate sagging face from the inner side of you. Yes, I will clinically elucidate the sagging of the face as a big surprise issue. Mr. Yamada, a retired man, was suffering from stiff shoulder, backache, headache, dizziness, tiredness, insomnia, and stress, which he could not understand why. He was just guessing that they are due to age or menopausal disorders of man. When he consulted his family doctor, the health specialist said, "Yes, I can see it in your sagging face. Why don't you undergo plastic surgery and fix your face?". Mr. Yamada did not understand completely the reason for plastic surgery. But because of his curiosity, he accepted the surgery to get rid of his sagging face. After a week, Mr. Yamada noticed his backache was gone. He felt as young as 35–40 years old. He can now sleep well and enjoy playing baseball with his friends. He now goes hitchhiking with his family. He can now enjoy listening music, too. Mr. Yamada told his experience to his friends and many of them followed the face lifting. Many of his friends experienced the same healthy conditions. In fact, some of his friends who are retired returned to work again. What does sagging face do to our health condition? Or what does our health condition do with sagging face? Is the sagging face caused by unhealthy condition or unhealthy condition makes sagging face? We really do not know which one comes first. Chicken or Egg? 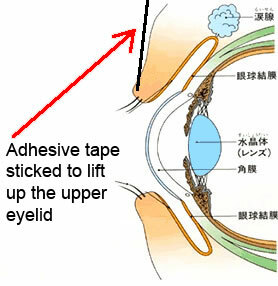 Whichever comes first, we understand that sagging eyelids indicate several unhealthy symptoms such as back pain, headache, dizziness, constipation, insomnia, chronic fatigue syndrome, cold intolerance, anxiety, and depression. According to several surgeons who performed surgery to improve and correct the sagging eyelids, the health conditions of patients were improved dramatically. Patients whose facial wrinkles were corrected and aligned beautifully, regained their normal health. 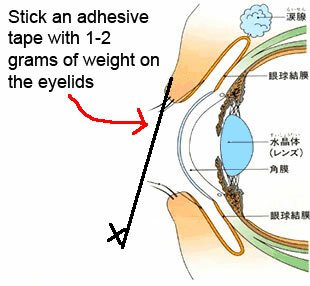 To find the mystery in sagging face, we requested some healthy and young good-looking male and female students to place a gram of paper sticker on their eyelids to simulate sagging face for awhile—creating pseudo-sagging eyelids. After some time, all of them started to feel very tired. 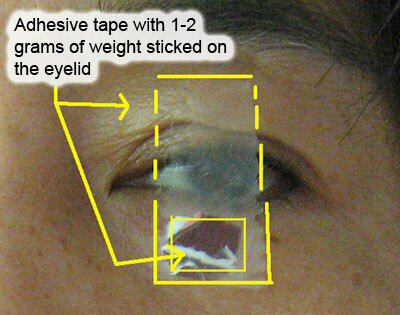 How is it that a matter of a single gram heavy eyelids makes them feel sick. Electromyography test found that several parts of muscles became abnormal and have stronger muscle tension when eyelids are sagged. All students showed the same result. Also, electromyography test showed that people with more wrinkles have more health problems. When their wrinkles are removed by any means whether by plastic surgery or face exercises (massages), their illnesses will be gone or will be reduced dramatically. Once again, we do not know which comes first, whether wrinkles appear first, or diseases come first. Whichever disappears, for sure, you will get fine. 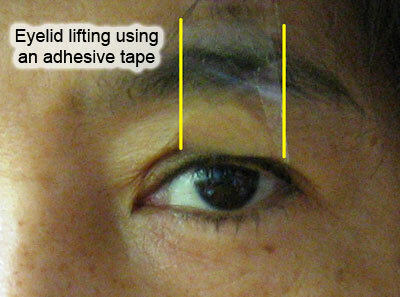 If you are suffering from stress, headache, fatigue, sinusitis, and insomnia, just a simple eyelid lifting by taping it to your forehead will get you well soon like what we have done for so many people. In this simple method, we received hundreds of report that even dreadful diseases like cancer were cured. Anyway, you won't lose your effort as you will get something in return.